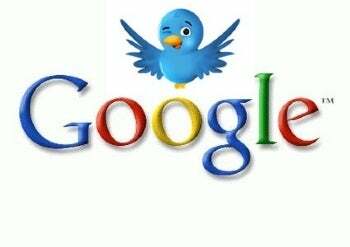 The rumor mill is in full gear today over speculation that Google may acquire Twitter. The news comes from two separate and unnamed sources that claim talks between Google and Twitter are in the late stages, according to TechCrunch's Michael Arrington. However, Arrington says he has spoken to a third source that says talks are just in the early stages. Arrington says his third source claims the talks may only result in the two companies collaborating on a real-time search engine for Google. There's no word on how much a Google-Twitter deal could be worth, but most estimates put it in the $1 billion range with Google paying a mix of cash and stock. I thought Google wasn't buying? This latest rumor comes only a few weeks after Google CEO Erich Schmidt called Twitter a "poor man's e-mail system" at the Morgan Stanley Technology Conference in San Francisco. During the conference, Schmidt said Google would wait for "prices to get better" before attempting any acquisitions. However, it was clear from his talk that Schmidt and Google had been putting a lot of thought into Twitter's future. Schmidt's Twitter musings included incorporating the service into traditional e-mail and for Twitter to evolve beyond what Schmidt called a "note phenomenon." Many believe a Google-Twitter deal makes sense since Twitter has the potential to take a bite out of Google's search business. Twitter Search does an excellent job of cataloguing real-time information from its users, and some have argued this ability threatens Google. However, at first glance, that premise doesn't seem realistic to me. The idea that people would turn to Twitter as their primary source of information is preposterous. Yes, perhaps during real-time events Twitter might enjoy a surge of popularity. This scenario already played out earlier this year during the US Airways crash near Manhattan and last year's terror attacks in Bombay. Nevertheless, Twitter Search as it stands now is not the best way to find movie times, a stock price or even a Wikipedia page. But put Twitter in the hands of a Google rival like Microsoft or Yahoo and you have a potential game-changer in the search business. A Google-Twitter deal could be a win-win situation for both companies and the everyday user. Google's enormous computing power could put an end to the infamous "fail whale," and the search giant would be able to monetize Twitter with its advertising programs. For Google, as Computerworld's Seth Weintraub points out, Twitter could help create "a better pool of data from which to pool [Google News] stories and gauge their popularity. It could also help Google's lagging social networking site, Orkut, by establishing connections between Google users."